1Herbivory bynoctuid mothlarvae(Lepidoptera,Noctuidae) onplantsofDaphne laureola L.(Thymelaeaceae)wasstudiedundernatural conditions inasouth-eastern Spanishmontane habitat. Themainobjectiveofthestudywastodeterminehowsize andarchitectural featurescorrelated withherbivorylevel(meanpercentageleafarea removedbytheendofthelarvalgrowthseason)andherbivoreload(meannumber ofcaterpillars recordedperday)bothamongandwithinplants. 2Asignificantcorrelation wasfound betweenherbivoreloadandherbivorylevelof individualplants.Herbivorylevelsdifferedwidely(range 0.1—12.8%leafarea)and wereconsiderablysmallerthanthoseoftenusedinartificialdefoliationexperiments. 3Variation among plantsintheincidenceofnoctuid larvaewasdirectlyrelatedto thenumberofleafwhorls,andinverselytothemeanbasaldiameter ofstems.These responsestosizeandarchitectural traitsmaybe explainedbydiscrimination by ovipositingfemales. (Moran & Whitham1990),physicalcharacteristics of foliage(Howard 1988)or plant gender(Elmqvist& Gardfjell1988;Boecklenetal.1990). itsmajor herbivores(lepidopteran larvae)byinvest­ igatinghowvariation insizeandarchitecture among shrubsrelatestodifferencesinherbivoryinthefield. Variationinplantarchitecturecouldinfluenceher­ bivoryratesviaitseffectsontheforagingcostsand behaviour ofcaterpillars. Plantsizeandarchitecture havebeenconsideredtoexplaindifferences inher­ bivory between species (Lawton 1983), but more rarelyamongconspecifics.Outofatotalof43studies reviewedbyMarquis (1992:Table 13.3)that exam­ inedtheeffectofplantcharactersonintraspecificvari­ ationin herbivoredamage,onlyfourconsidered architecturaltraits. been documentedpreviouslyforshrubs.Within-plant variation in herbivory was therefore studied in addition toamong-plantdifferences.Acomparison ofwithin-andamong-plant analysesmayillustrate possible conflictsbetweenpreferencesoflepidopteran larvaeandhostselectionby ovipositingfemales (Thompson 1988). thus:(1)Do D.laureolaplantsdiffersignificantlyin sizeandarchitectural traits,andinherbivory levels? (2)areindividualdifferencesinherbivory among D. laureolaplantsrelatedtovariation insizeandarchi­ tectural traits,(3)doherbivoresexhibitwithin-plant selectionand(4)arewithin-andamong-plantchoices consistent? D.laureolaplantsconsistofavariablenumberof erectstemsthatriseatground level fromacommon trunk(Fig.1).Leavesarefoundonlyatthedistalend ofeachbranch,formingasingle,well-defined leaf whorl.Individualstems mayremainundividedormay ramifyinto two,threeorfour branches, whichalso may branch again or remain undivided. Variation amongplantsinthenumber,lengthanddegree of branchingof stemsgeneratesabroadspectrumof architectural types inthisspecies.Fromtheviewpoint ofslow-moving,flightlessinvertebrate herbivoresthat havetocrawlalong barestemstoreachleafwhorls (e.g. lepidopteran larvae),foodresourceswithinD. laureolaplantsoccuraswidelyspacedpackages.Each oftheseprovidesfoodin excessofindividualrequire­ ments during asingleforaging bout, but the need forregularsearchpresumablyimpliescertaincostsin termsoftimeandenergy. 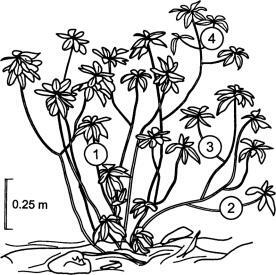 Fig.1Characteristicarchitecture ofaDaphnelaureolaplant. Numerals denote thedifferentbranching orders associated withindividualleafwhorls. lentsubstancesin thefoliage(Hegnauer1973).Grass­ hoppers wereoccasionally observedon studyplants buttheirdamage(which couldbeeasilydistinguished from that caused bycaterpillars) wasnot recorded. Somegeometridlarvaewere alsoobservedspor­ adicallyonD.laureolaplantsbut,astheywerenever seen feeding on the foliage, were not considered further.Alllarvaerecordedfeedingwerefromnoctuid moths(Noctuidae).Themostabundantspecieswere TrigonophoraflammeaEsper. (44.1%oftotalrecords) andNoctuajantheBkh.(38.4%). Other species observedwerePseudenargia ulicisStaud. (10.2%)and Noctua‘fimbriata’(=N.fimbriataSchreb.+ N.tir­ renicaBieb.,Spdl.Hngk.) (7.3%) (fortaxonomic identityseeYela1992).Inthestudyregionthesefloe­ tuidspeciesareallpolyphagous onavarietyofher­ baceousandwoodyplants(J.L.Yela,personalcom­ munication; T. flammea,for instance, isknown to feedonsuchdisparate plantsasCrataegus,Quercus, Arbutus,Phillyrea,NarcissusandPaeonia,inaddition toDaphne). Weonlyevaluated theimportance of caterpillarsas consumersof foliage(largelyyoung leaves), although they also consume flowers and unripefruits. Noctuajanthe larvaeweremostfrequentonD. laureolaearlyintheseason(Apriltomid-May). Lar­ vaeremainedinactive duringdaytime,hiddeninthe litterbeneath theplants,andclimbedatnighttothe leafwhorls to feed.They did not usually feedon thesameleaf whorlduringconsecutivenights.This speciesbelongstothe‘shortpupalduration’groupof Mediterranean Noctuidae(Yela& Herrera 1993)and adultsemergeearlyinthe summer,shortlyafter pupation.LarvaeofTrigonophoraflatnmeaweremost frequentonD.laureolafromearlyMaytomid-June, when pupation occurred. Their foraging behaviour wasfoundtovarywithage.From thefirsttofourth instars,larvaearegreen-coloured,remainhiddendur­ ingdaytime among theleavesofD.laureolaplants, and feedon thesameleafwhorl forseveralnights. Afterenteringthe fifthinstar,theybecomebrown- coloured and hide in the litter beneath the plants duringthedaytime,climbingtotheleafwhorlsevery nighttofeed.Atthisstage,theydidnotfeedonthe sameleaf whorlduringconsecutivenights.Tn­ gonophoraflammeapassesthesummeraspupa(‘long pupalduration’ groupofYelaHerrera 1993),and adultsemergebyearlyOctober. ThestudywascarriedoutduringApril—June1994on apopulationofmarked Daphnelaureola individuals (N=28plants)locatedintheSierradeCazorla(Jaén province, south-eastern Spain), on a north-facing slopeat1235ma.s.l.(CAsiteinYelaHerrera1993). Themarkedshrubswerepartofotherinvestigations (YelaHerrera 1993;andJ.L.Yela,unpublished), andrepresentedarandomsubsample ofthelocalD. laureola population.Nearest neighbourdistances betweenmarkedplantsrangedbetween0.2—30m,and thetotalstudyareawasabout 1500m2. Atthestudy site, D.launeolagrows asan understorey shrub in adense mixedforest, with Quercusrotundjfolia,Q. faginea,Pinusnigra,PhillyreafatjfoliaandJuniperus oxycedrusasdominant treespecies,and Rubusu/mi­ folius,CrataegusmonogynaandRosacaninaasdomi­ nantshrubs. Plant structure wascharacterized according tosep­ arate size andarchitectural measures,although relationshipsmayexistbetweenthetwotypesoffea­ tures. overallcharacterizationforanindividual plant. For eachmarkedplantweusedthenumberofleafwhorls, theheight ofthetalleststem(‘plantheight’hereafter) andthegeometricmeanofthemajordiametersofthe plant’sverticalprojection(assimilatingittoan ellipse) asestimatesofplantsize. TheincidenceofherbivoresonmarkedD. laureola plantswas assessedbothasthefrequencyofoccur­ renceofcaterpillars during nocturnal censuses(‘her­ bivoreload’)andastheproportion ofleaftissue removed(‘herbivorylevel’). Inorder todetermine thenatural herbivoreloadon markedplantswemadeeffortstodisturbcaterpillars aslittleaspossible.Observations oflarvaewerecon­ ducted at night (from 2l.O0hours to 24.O0hours GMT), whentheywereactiveandmostconspicuous. Observations were conducted on two consecutive nights each weekover the whole study period, to enable short-term variation in the distribution of caterpillars tobeassessed.Plants werecheckedina differentorder oneachnighttoavoidpossiblearte­ factsduetolarvalactivityrhythms.Oneachoccasion, thefoliageofallmarked plantswascarefullyexam­ inedatcloserangeusingaheadlamp todetectactive caterpillars. Werecorded thetaxonomic identity of everycaterpillar observedandmarkedoneleafofthe whorlonwhichitwasfeeding.Differentcolours of plastictapewereusedformarkingondifferentdates. Meanvaluesofherbivorylevelwerecomputed for control and marked whorls of all marked plants (exceptfor a plant without caterpillar records and thus lacking marked whorls), and compared using pairedt-tests.As expected,averageherbivorylevels were significantlygreaterinmarkedwhorlsthanin control ones(t=5.48,N=27,P0.0001).This indicatesthat,althoughoursamplingscheme was incomplete(onlytwoobservation nightsaweek),the observations providedareliable assessmentofthe distribution ofcaterpillars withinplants. Nonparametric statisticalmethodswere used wheneverdatadeparted fromnormalityornormality testscouldnotbe performedreliablyduetosmall samplesizes. Statisticalanalyses,unlessotherwise stated, wereconducted usingprocedures intheSAS package(SASInstitute1989). Thesignificanceof differences amongplantmeanswastestedwith Kruskal—Wallisanalysisofvariance(NPAR1WAY pro­ cedure). Relationships between variables were assessedusingregressionmethods (REG procedure), and the significance of regression coefficients was testedusingrandomization methods(Noreen1989; Manly1991)whenvariablesdidnotfulfilnormality requirements. Within-plant differences between marked and control whorls were analysed using pairedt-tests. P0.0001), and mean branching order of leaf whorls(H27=120.9,P<0.0001)(dataforcontrol andmarkedwhorlscombinedforeachplant). Werecorded337noctuidlarvaeover22 obser­ vation nights. Both mean herbivory levelsand her­ bivoreloadsdifferedwidelybetweenplants(Fig.2). Therewasstatisticallysignificantindividualvariation inboththenumberofcaterpillarsrecordedperobser­ vationsession(H27=133.4,P0.0001)and inthe proportionofleafarearemovedbytheendofthestudy (H27 =118.4, P< <0.0001).These two variables werepositivelycorrelated across plants (r=0.508, P=0.007). Afewplants had both high herbivory levelsandcomparatively fewlarval records(Fig.2), andthesignificance oftherelationshipincreases dramaticallyafterremovingthese outliersfromthe analysis(r,=0.764,P=0.00003).Noinformation is available toexplaintheoccurrence oftheseoutliers, butthe overallsignificantassociationacrossplants betweenherbivoreloadandherbivorylevelindicates, at least, that (1)our nocturnal observation scheme wassufficienttodetectindividualvariation incater­ pillarabundance; (2)observeddifferencesamong plantsinleafdamagewereconsistentwithdifferences intheabundanceofherbivores;and(3) eithercanbe usedtodescribeindividualvariation intheincidence ofherbivores. Fig.3Relationship betweenmean herbivory level(%leaf arearemoved)and meanbasalstemdiameterofindividual Daphnelaureolaplants. sideredweretotalnumberofleafwhorls,thesquare root oftheproduct ofmajor and minor diameters, plantheight,andthe weighted plantmeansfor stem basal diameter, stem length, and number ofleaves andbranching orderofleafwhorls.Thesignificance levelof those variables showing the largest effects werecomputed usingrandomizationmethods. Only totalnumberofleafwhorlsandthemeanbasaldiam­ eterofstemshadsignificanteffectsonherbivorylevel andherbivoreload(Table1).Acrossplants,herbivore load wasdirectly related to number ofleafwhorls and inversely(although onlymarginally significant) tomeanbasalstemdiameter. Herbivory level was inversely relatedtomeanbasalstemdiameter(Fig.3), withdamagebeingpredictablysmallestamongplants withthethickeststems.Noneoftheotherplanttraits considered exhibited significant relationships with eitherherbivorylevelorherbivoreload. Thedifferencebetweenmarkedandcontrol whorlsin averagestembasaldiameter, stemlength,branching order, andnumberofleaveswastestedusingpaired t-tests.Foreachcharacteristic tested,data pairswere therespectivewithin-plant averagesformarked and control whorls.Onaverage,leafwhorlswherecater­ pillars had been recorded had significantly more leaves,lowerbranchingorder,andshorterstemsthan control ones(Table 2).Meanbasaldiameter wasnot differentincontrol andmarkedwhorls.Theseresults suggestthatcaterpillarsshowsomewithin-plantselec­ tionoffeedingsitesbasedonstructuralcharacteristics ofleafwhorlsandtheirsupportingstems. Nuñez-FarfánDirzo1994). Conversely,studies analysingherbivoreloadshavenotoftenrelatedthem toproportionallossesinplantfoliage(Cottan eta!. The significantrelationshipfoundacrossindividual plantsbetweenherbivoreload(numberoflarvaerec­ orded)andherbivorylevel(percentageleafareaeaten) indicatesthatestimatesoffoliarlossesattheendof theseasonadequately reflectedthedefoliation inten­ sityexperienced byindividual plantsofD.laureola. Thus, at leastinthisspecies,measurements ofleaf arearemovedmaybereliablyusedtoassessthedis­ tribution ofinvertebrate herbivoresbothamongand withinplants. 1984; Elmqvist Gardfjell 1988; Marquis 1988). inexperimental studies.Thesefindingshighlightthe needforconducting pilotstudiesunder natural con­ ditionspriortoundertakingartificial defoliation experiments.Defoliationtreatmentsshouldthen be chosen to becomparableto herbivory levelscom­ monlyfacedbyplantsinthefield,rather than only totheextremefigures experiencedduringherbivore outbreaks. !aureolaplantsmighteasilydiscriminateamongthese plantsonthebasisoftheiroverallsize,asreportedfor otherlepidopteran species(Forsberg1987;Karban & Courtney1987);itseemslesslikelythattheycoulduse thebasaldiameterofstemsasacueinhostselection. LarvaeofT.flammeaand N.jantherarelyappear to movebetweenD. !aureolaplants(C.Alonso,personal observation), solarvalselectionbetweenplantscan­ not explain observed patterns. Differential sur­ vivorshipofcaterpillars(ZangerlBerenbaum1993) onplantswithstemsofdifferentthicknesses,perhaps relatedtostructure-dependent difficultiesfacedby younglarvaeinreachingleaf whorls,couldpartly explainsubsequentdifferences inbothfrequencyof caterpillars anddamageexperiencedbytheplants. The modest defoliation levelsexperienced by D.
!aureoladuring thisstudy are representative forthe speciesinthestudyregion(C.M.Herrera,J.L.Yela, unpublished data). Such levels may or may not decreaseplantreproduction orsurvival,butevol­ utionary responses tothecorrelation betweenplant traits and damage would require that the traits involved were heritable. Number and diameter of stems, the traits correlated with herbivory, pre­ sumablydependmoreonplantage,developmentand locationinthehabitatthanonintrinsicplantfeatures. Noctuidmothlarvaethereforeseemunlikelytoactas selectiveagentson D.!aureola,atleastforthetraits consideredhere. Withinplants,larvaeoccurredmostfrequentlyinleaf whorlscharacterized bylowerbranchingorder,shor­ terstems,andgreater numberofleaves.Sincecater­ pillarsarepresumablyunableto detectdifferences amongleafwhorlsinchemicalorphysicalproperties offoliage,ifany,untiltheyhavereachedtheleaves (Schultz1983), theseresultsindicatethatstructural traitsofstemsareusedascueswhileaccessingfeeding sites. Larvaedidnotappeartodiscriminateamong stemsatground level, astherewerenosignificant differencesbetweenthebasaldiametersofcontroland markedwhorlsofthe sameplant,insteadselection occurredatstemforks,favouringtheshortestpossible routetoaleafwhorl(lowerbranchingorder). Foliageis patchilydistributed withinD.laureola plants, occurring in the form of dense clusters of leavesseparated bya network of rewardlessstems. Thenonrandom,architecture-relateddistribution of larvaeamongleafwhorlsmaythusreflect(I)aselec­ tiveresponsetodifferencesintheamount offoliage, aimed at increasing the food value of the patch chosen;(2)abehavioural responsetothecontrasting costsassociatedwithforagingalongstemsofdifferent length,directedatdecreasingthe movementcosts requiredtoreachthefoodpatch;or(3)acombination ofthesetwoeffects. Thefirstexplanation seems unlikely,sinceall leafwhorlsprovideavirtually unlimited food supply to larvae (the maximum amount offoliagethatanindividuallarvacaningest duringafeedingboutis someordersofmagnitude smallerthantheamount offoliageavailable).Thisis supported bytheobservation that96.2% ofmarked whorls had mean herbivory levels <30%,and no whorlwaseverfoundwithanherbivorylevel70% (despitepotential re-visitationofthesameleafwhorl ondifferentdates).In contrast, larvaetendedtooccur mostfrequentlyinwhorlswith shorterstems,sug­ gestingaroleformovementcostsinexplainingtheir distributionwithinplants. Schultz(1983)proposedthatcaterpillarfacetrade­ offsamongfeedingcosts,predation risks,andmove­ mentcosts,andsuggestedthat thelastfactor isthe mostimportantinnocturnalcaterpillars.Thissugges­ tionisconsistent withour interpretationofwithin- plantlarvaldistribution,andalsowiththeforaging behaviourexhibitedbyT.flammea. Green-coloured larvaeofthisspecies, cryptictovisuallyorientated enemies,remainedfeedingonthesameleafwhorlfor several consecutivenights,thusreducingmovement coststoaminimum.Whenrisksincreasedasa conse­ quence ofcolour change, the foraging pattern was alteredtoadailymovementbetweenfeedingsitesin leaf whorlsandhidingplacesbeneaththeplants.If reducingthemovementactuallydiminishesforaging costs and, subsidiarily, reducesthedurationof the larvalperiodandalsodecreasespredation risk,there couldbeselectionfortheuseofarchitectural traitsas cuesforaccessing foragingsites.Giventhepol­ yphagousbehaviourofT.fiammeainthisregion,itis surprisingthatthe speciesdisplaysfinelytunedbehav­ iourwhenfeedingonbothD.laureolaandotherplant species(whenfeedingon Narcissuslongisparhus,T. flammeaalsoshowsacolour-dependentactivitypat­ tern;C.M.Herrera,unpublisheddata).Thusthepol­ yphagous condition does not necessarily mean reduced capabilitiestoadjustindividualforaging behaviour to the characteristics of different host plants. differencesinherbivoreloadarerelatedtovariation innumberof whorlsand(marginally)tomeanstem diameter,whilewithinplantstheyarerelatedtovari­ ationinstemlength,branchingorder,andnumberof leavesperwhorl.Thisdiscrepancymaybeattributed todifferencesbetweenthechoicesexertedby ovi­ positing moths (among plants) and by the larvae (withinplants),andprobablydependonthe relative amounts ofvariabilityexhibitedbythestudiedtraits atthetwoscales.For thearchitectural traits exam­ ined,thewithin-plant component accounted for roughlythreetimesasmuchvarianceastheamong- plantcomponent(Table3), thusprovidingcon­ siderableopportunitiesforlarvaetotakeadvantage ofstructural cues.Ovipositing females,ontheother hand,weremostlikelyconstrained touseothercues intheirselection,suchasthenumberofleafwhorls. Insectsmaynotuse thesameplantfeatureswhen decisionsaretakenatdifferentlifehistorystages,or maybeunabletodoso.Ultimately. theimplications ofthisphenomenon willdepend onwhether or not discriminationamongconspecific plants(Rausher& Papaj 1983;Forsberg 1987;Karban 1992)orwithin plants(Whitham 1983) hasdemographical conse­ quencesfortheinsectspeciesinvolved.Inthecaseof D.laureola,furtherstudiesareneededtoassessthese demographical consequences. We areparticularlyindebtedtoJoséL. Yelafor enthusiasticsupport andencouragement, andfor teachingussomanyimportantdetailsofthenatural historyofnoctuidmoths.He,M.C.Anstett,P.Jord­ ano,J.M.vanGroenendaelandtwo anonymous reviewersprovidedusefulcommentsandcriticismson earlier versionsof themanuscript. P.Jordano also drewFig.1forus.AliciaPrietoandRocjoRequerey providedtechnicalassistance.TheAgenciadeMedio Ambienteauthorized our workinCazorla and pro­ videdinvaluablefacilities.Thisstudywassupported byDGICYTgrant PB9I-0114andapredoctoral fel­ lowshipfromtheMinisterio deEducaciOnyCiencia toC.A. Boecklen,W.J.,Price,P.W.Mopper, S.(1990)Sexand drugsandherbivoryinarroyo willow (Salix lasi­ olepensis).Ecology,71,581—588. Dirzo,R.Harper,J.L. (1982) Experimentalstudieson slug—plant interactions: III. Differences in the acceptabilityofindividualplantsofTrifoliumrepensto slugsandsnails.JournalofEcology,70,101—117. Dudt, J.F. Shure, D.J. (1994)Theinfluenceoflightand nutrientsonfoliarphenolicsandinsectherbivory.Ecol­ ogy,75,86—98. Forsberg, J. (1987)Sizediscrimination among conspecific hostplants intwopieridbutterflies;Pieris napiL.PontiadaplidiceL.Oecologia.72.52—57. Hare, D. (1992) Effectsof plant variation on herbivore- naturalenemyinteractions. Plantresistancetoherbivores and pathogens. Ecology, Evolution and Genetics (eds R.S.FritzE.L.Simms),pp.278—298.Universityof ChicagoPress,Chicago. Heichel,G.H. Turner, N.C. (1984)Branch growth and leafnumbersofredmaple(Acerrubrum L.) andredoak (QuercusrubraL. latifolia.):Responsetodefoliation. Oecologia,62,1—6. 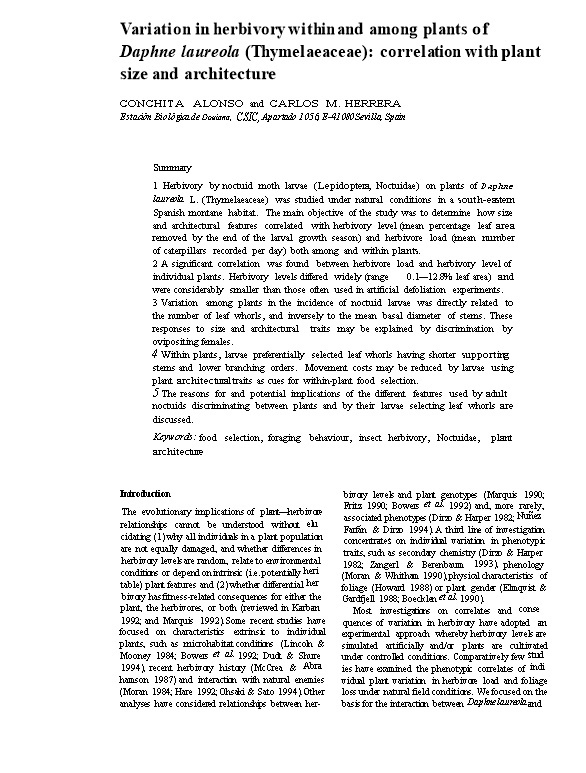 Howard, J.J. (1988)Leafcutting antdietselection:relative influenceofleafchemistryand physicalfeatures. Ecol­ ogy,69,250—260. Hulme,P.E. (1992)Theecologyofatemperate plant ina mediterranean environment:post-dispersalseed pre­ dation ofDaphnelaureola.Plant—AnimalInteractionsin Mediterranean-TypeEcosystems(ed.C.A.Thanos),pp. ofherbivorousinsects.Plantresistancetoherbivoresand pathogens.Ecology,EvolutionandGenetics (edsR.S. Fritz E. L. Simms), pp. 195—215. University of ChicagoPress,Chicago. Karban, R.Courtney, 5. (1987)Intraspecifichost plant choice:lackofconsequencesforStreptanthustortuosus (Cruciferae)and Euchloe hyantis(Lepidoptera:Pier­ idae).Oikos,48,243—248. Maddox,G.D.Root,R.B. (1987)Resistanceto16diverse species ofherbivorousinsectswithinapopulation of goldenrod, Solidagoaltissima: geneticvariation and heritability.Oecologia,72,8—14. Marquis, R.J.(1990)Genotypic variation inleafdamagein Piperarieianum(Piperaceae) byamultispeciesassem­ blageofherbivores. Evolution,44,104—120. Marquis, R.J.(1992)Selectiveimpact ofherbivores. Plant resistancetoherbivoresandpathogens.Ecology, Evol­ utionand Genetics(edsR.S.FritzE.L.Simms),pp. Right Or Wrong: Whose Call?